Do you work at O2 Academy Birmingham? 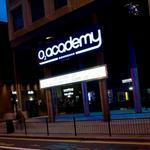 What did you think of O2 Academy Birmingham? I've been here a couple times and although the bands I went to see usually sound great this place has an ability to destroy all sound quality. The place is an old night club and the speakers sound like they was never upgraded. All boom, hardly much mid range and completely inaudible high frequency. I recall watching the drummer hitting the symbols and not hearing anything. I'm sure it probably sounds a bit better if you're squashed up the front where the sound system has less effect but It also gets that hot that on our one visit we saw someone pass out due to the intense temperature. Worst venue I have ever been to for live music and i've been to quite a lot of venues!